Nita and Mukesh Ambani hosted a party on Friday night at their Mumbai residence to celebrate Ganesh Chaturthi. The star-studded party was attended by Bollywood celebrities like Amitabh Bachchan, Jaya Bachchan, Abhishek, Aishwarya, Shah Rukh Khan, Salman Khan, Aamir Khan, who arrived with wife Kiran Rao, Deepika Padukone, Ranveer Singh, Priyanka Chopra, Ranbir Kapoor, Karan Johar, Kajol, Hema Malini and others. 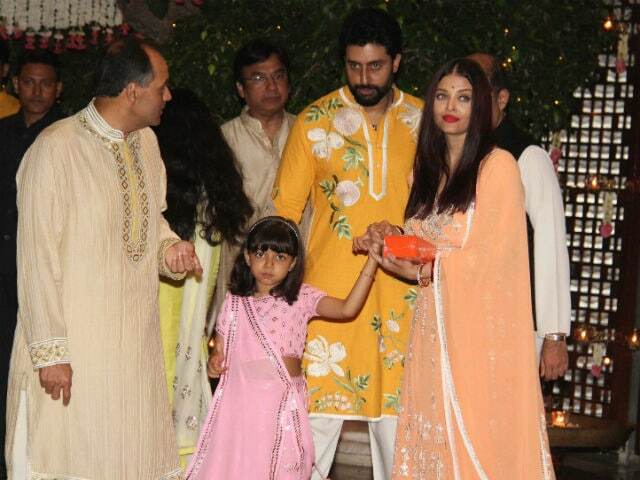 Abhishek and Aishwarya’s daughter Aaradhya and Aamir and Kiran’s son Azad were also there. Sara Ali Khan and Jhanvi Kapoor too were a part of the big celebrations. 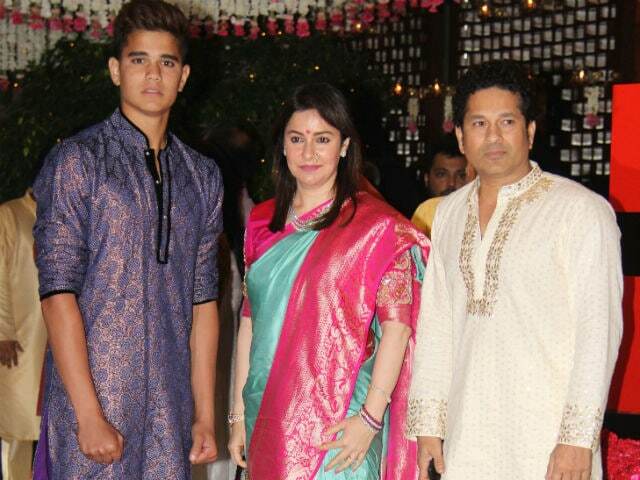 Sachin Tendulkar attended the party with wife Anjali and son Arjun. 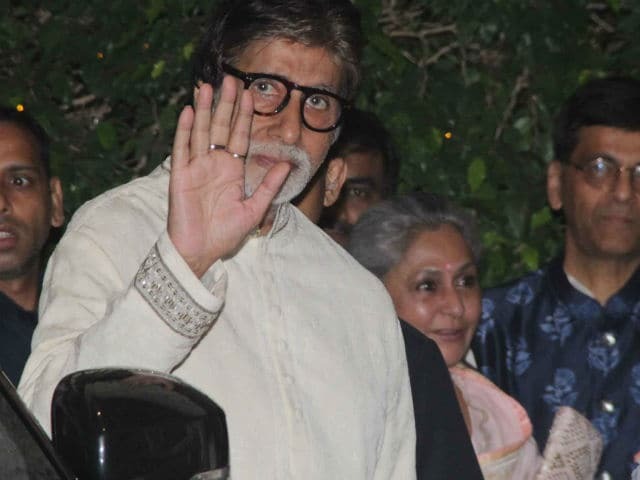 Amitabh Bachchan was first pictured alone, later Jaya Bachchan, Abhishek and Aaradhya accompanied him. 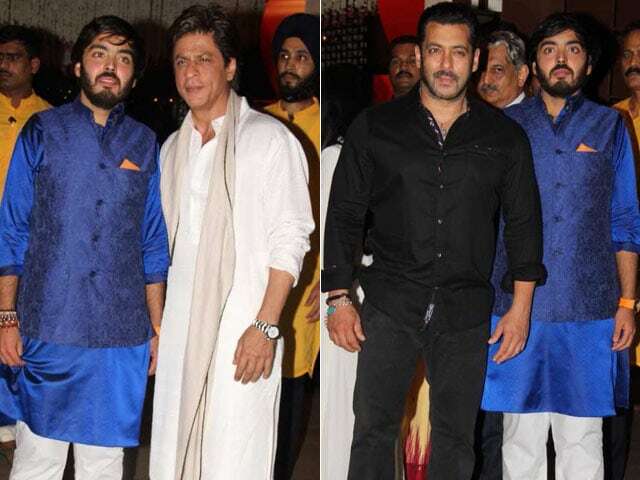 Shah Rukh Khan wore a white kurta pyjama for the party while Salman was casually dressed in black. 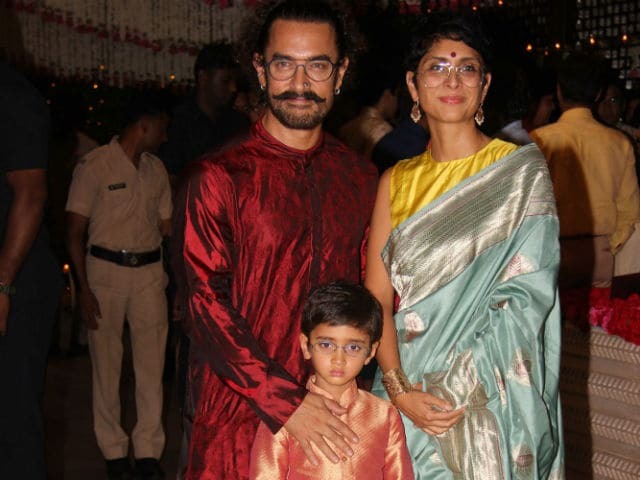 Aamir opted for a red and black kurta pyjama while Kiran wore a beautiful sea green sari. But Azad stole the limelight from his parents with his cute expressions and his Indian outfit. Deepika and Ranveer arrived for the party together and just couldn’t stop smiling at each other. Sara Ali Khan, daughter of actors Saif Ali Khan and his first wife Amrita Singh looked resplendent in a pink and golden anarkali suit. Sridevi and Boney Kapoor’s daughter Jhanvi picked a cream lehenga with floral motifs. Priyanka Chopra, who returned from US just a week ago, attended the party with mother Madhu. 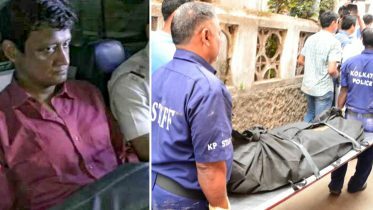 Sanjay Dutt and Maanyata complemented each other in blue. 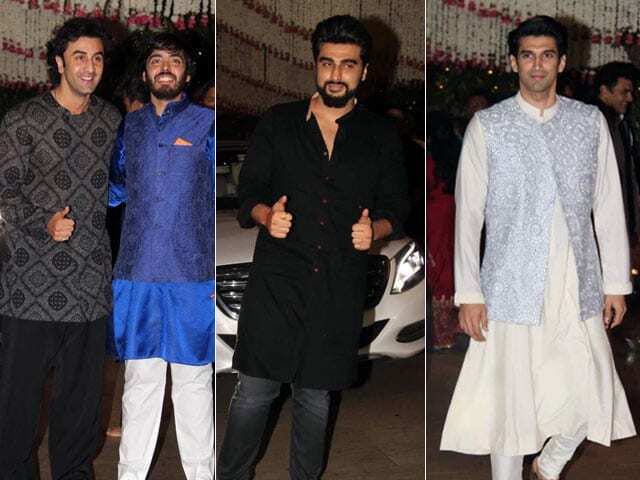 Ranbir Kapoor, Arjun Kapoor, Aditya Roy Kapur were also there. 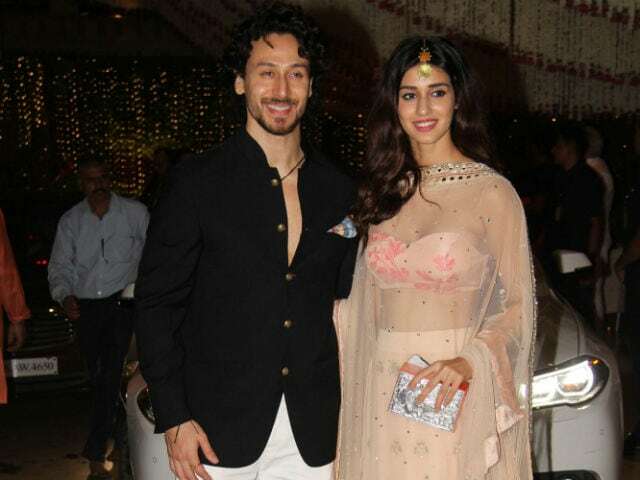 Rumoured couple Tiger Shroff and Disha Patani posed for the paparazzi together. 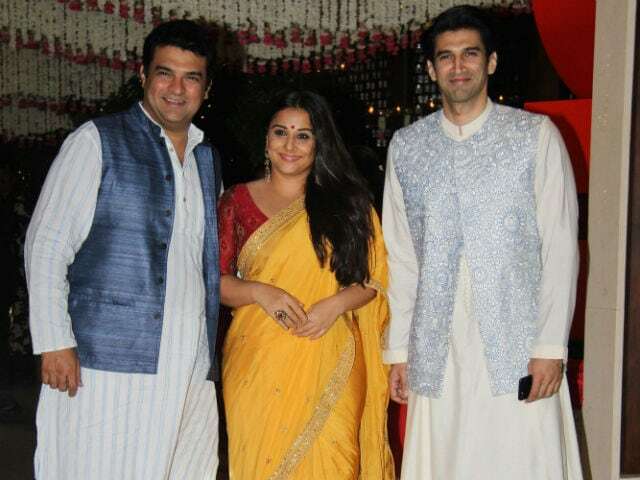 Vidya Balan looked like a million bucks in a yellow sari as she posed with husband Siddharth Roy Kapur and brother-in-law Aditya. Sachin Tendulkar photographed with wife Anjali and son Arjun. 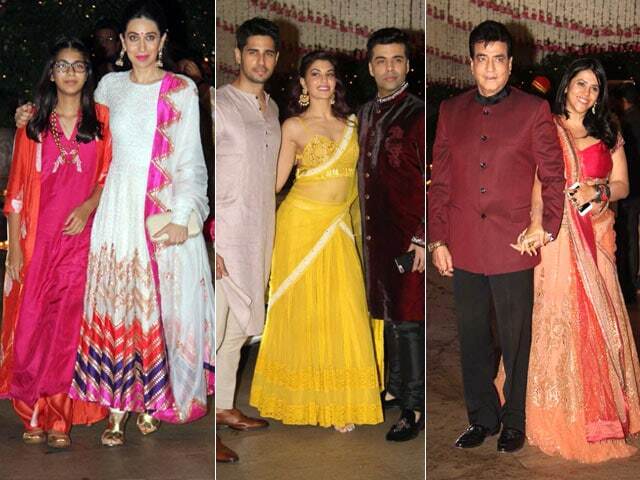 Here are pictures of other stars who were a part of the celebrations. Ganesh Chaturthi festival commenced yesterday. The 10-day long festival will end on September 5. 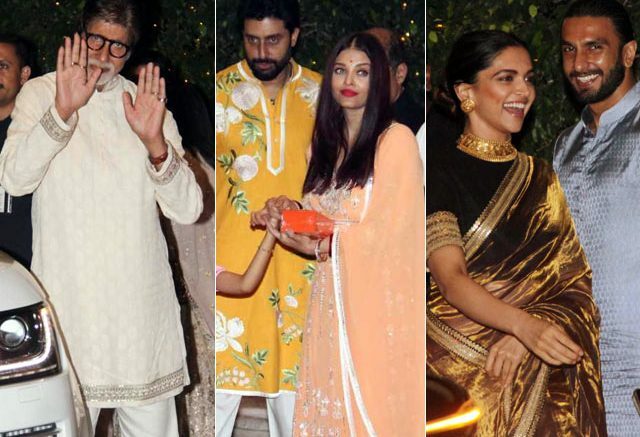 Be the first to comment on "Ganesh Chaturthi 2017: Amitabh Bachchan, Abhishek-Aishwarya, Deepika-Ranveer And The Khans Attend Mukesh Ambani’s Party"